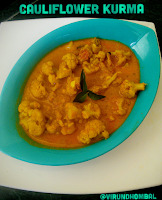 Kurmas usually involve the whole spices, onions, tomatoes and the coconut paste.This Cauliflower Kurma also includes the same ingredients, but lots of chopped small onions and chopped garlics which add a unique taste and flavor in this dish. This Kurma pairs well with poori, roti, parotta, aapam and dosas. It even tastes good for ghee rice and vegetable pulav. This kurma is one of my all time favourite dish. The preparation work and the ingredient lists are very simple. The only thing that takes time in this dish is chopping the onions and garlics finely. If you do not have small onions, replace it with the regular onions. 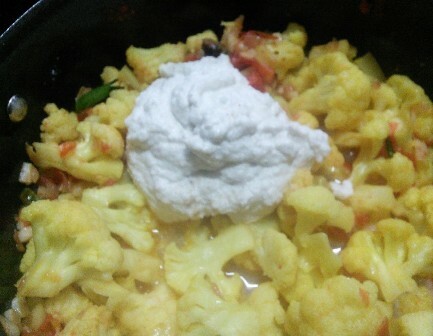 For this Kurma choose cauliflowers which are tightly packed.The thickness of the kurma is also similar to many kurmas but the taste of the cauliflower kurma is more unique than many other kurmas. The cauliflower florets are precooked for few minutes and then you have to cook them well in the coconut paste. With a perfect combination like small onions, garlics, tomatoes and the coconut paste you can prepare a restaurant style kurmas. 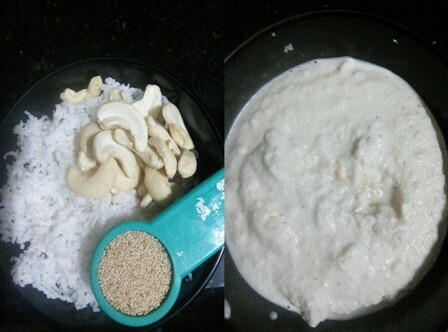 For this kurma do not load it with too much of spices and garamasala powder. It should be mild with the combination of all the flavours. I hope you follow these instructions and try this kurma at your home. 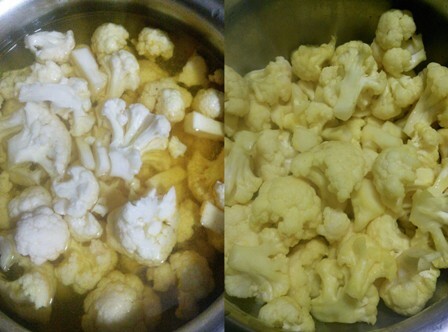 If you have not cauliflowers in your kitchen, you can add boiled eggs in the final stage. Remove the green stalks from the cauliflower and separate each florets. Cut the thin white stems. Take a bowl and boil 2 cups of water. Add a pinch of turmeric powder and salt. Add the florets and close it with a lid. After 10 to 15 minutes drain the water completely. Wash the florets 2 to 3 times in cold water. Grind the coconuts, poppy seeds and cashew nuts to a fine paste. 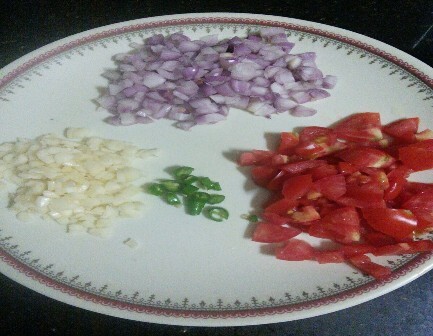 Chop the small onions, garlics, tomatoes and green chilly finely. Now add 1/4 cup of water to the cauliflower florets and cook them on low flame for 7 minutes. Do not over cook them. Heat 2 tbsp oil in a kadai or pan and add the cloves, cinnamon and star aniseed. Let them pop and add the finely chopped onions.Stir and saute it well. 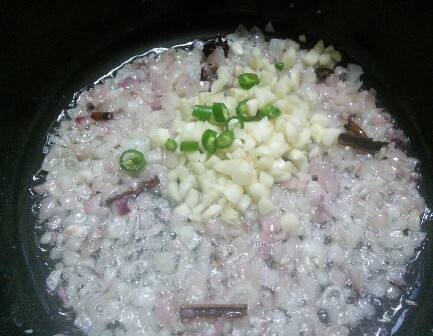 When the onions turn soft, add the chopped garlics, green chillies. Saute them on low flame. 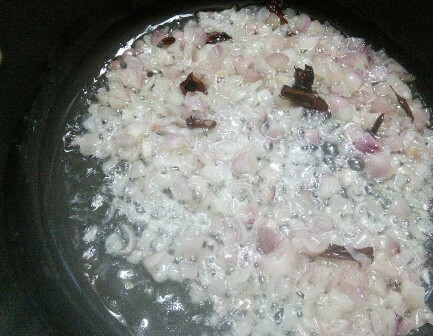 Do not brown the garlics then it will change the taste. Next, add the tomatoes and curry leaves. Saute them well until it softens. 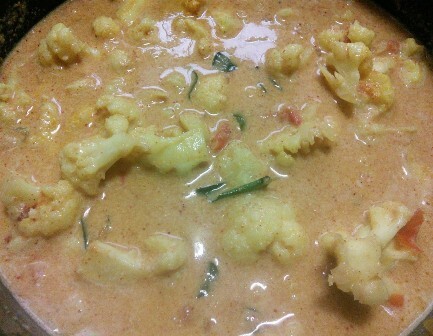 Now add the cooked cauliflower florets and saute them well with the onion tomato mixture. After few seconds, add the ground paste and 1.5 to 2 cups of water. Mix them well and add the turmeric powder, chilly powder, garamasala powder and required salt. Now close it with a lid and cook for 15 to 20 minutes on low flame. 1. Remove the green stalks from the cauliflower and separate each florets. Cut the thin white stems. Take a bowl and boil 2 cups of water. Add a pinch of turmeric powder and salt. Add the florets and close it with a lid. After 10 to 15 minutes drain the water completely. Wash the florets 2 to 3 times in cold water. 2. Grind the coconuts, poppy seeds and cashew nuts to a fine paste. 3. 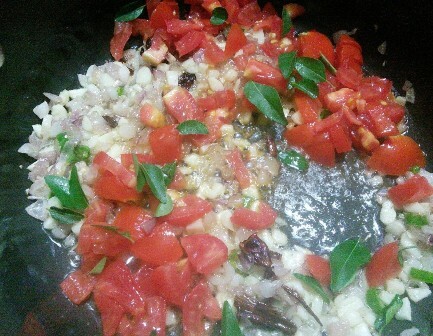 Chop the small onions, garlics, tomatoes and green chilly finely. (If using big onions, chop 1 medium onion finely). 4. 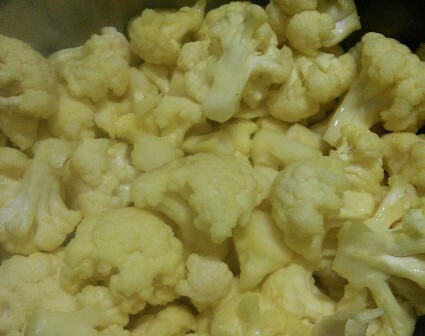 Now add 1/4 cup of water to the cauliflower florets and cook them on low flame for 7 minutes. Do not over cook them. 5. Heat 2 tbsp oil in a kadai or pan and add the cloves, cinnamon and star aniseed. Let them pop and add the finely chopped onions. 6. Stir and saute it well. When the onions turn soft, add the chopped garlics, green chillies. Saute them on low flame. Do not brown the garlics then it will change the taste. 7. Next, add the tomatoes and curry leaves. Saute them well until it softens. 8. 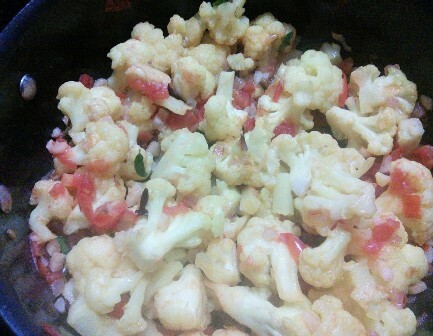 Now add the cooked cauliflower florets and saute them well with the onion tomato mixture. 9. After few seconds, add the ground paste and 1.5 to 2 cups of water. 10. 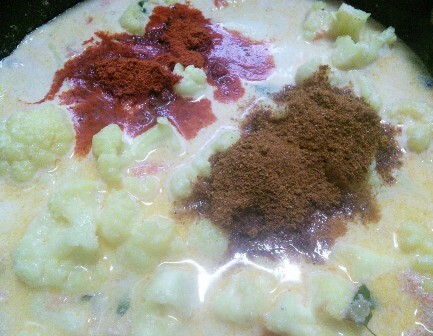 Mix them well and add the turmeric powder, chilly powder, garamasala powder and required salt. 11. Now close it with a lid and cook for 15 to 20 minutes on low flame. 12. 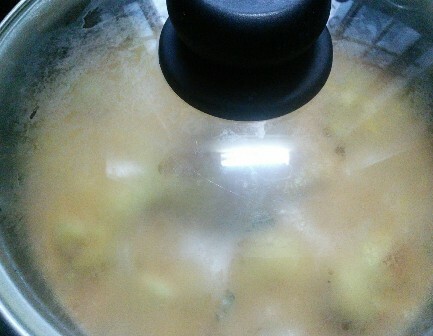 When the oil seperates on the top of the kurma or leaves on the sides of the kadai switch off the flame. Keep it covered for 20 minutes and transfer it to the serving dish.